As described by Joan at her trial she sent a letter to the clergy at St. Catherine de Fierbois with instructions for locating a sword at their church. "While I was at Tours or Chinon, I sent for a sword which was in the church of St. Catherine de Fierbois, behind the alter, and it was found at once all covered with rust." 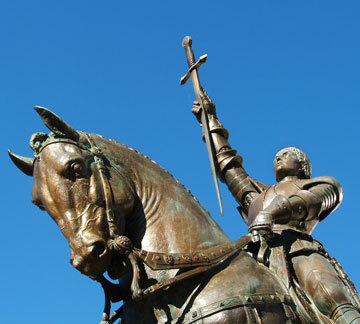 February 27, 1431 Joan responded to the question: "How did you know that this sword was there?" "This sword was in the earth, all rusty, and there were upon it five crosses, and I knew it by my voices and I had never seen the man who went to seek this sword. I wrote to the prelates of the place that if they please I should have the sword and they sent it to me. It was not very deep under ground behind the alter, as it seems to me, but I do not know exactly whether it was before or behind the altar. After this sword was found, the prelates of the place had it rubbed, and at once the rust fell from it without difficulty. There was an arms merchant of tours who went to seek it, and the prelates of that place gave me a sheath, and those of Tours also, with them, had two sheathes made for me: one of red velvet and the other of cloth-of-gold, and I myself had another made of right strong leather. But when I was captured, it was not that sword which I had. I always wore that sword until I had withdrawn from Saint-Denis after the assault against Paris."